This park is great if you want to get some fresh air! Four blocks long, the numerous paths allow you to walk or run. There is plenty of open space to play with your child and lots of trees to provide shade on a hot day. Also, its a great place for a picnic! There is a small, fenced in playground for kids, designed by Miller Company Landscape Architects. It is in good condition with two tennis courts. There are picnic tables to sit at and restrooms available. 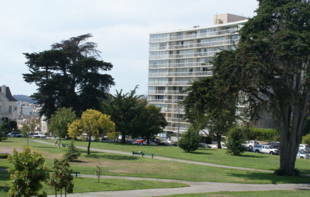 Lafayette Park is owned by the San Francisco Recreation and Park Department. Muni: #1-California -- Sacramento Street at Laguna, Octavia or Gough. #12-Folsom -- Washington Street at Gough or Laguna. Ratified by the State Legislature, Lafayette Park was created in 1867 but whether it had been dedicated as a park was questionable. City Attorney Samuel Holladay claimed it had not. His land stretched from Van Ness Avenue to the top of the Clay Street Hill, as Lafayette Park was then known. He fenced in six plots between Gough and Octavia Streets and built a white Italianate mansion with a barn and a windmill on the hilltop. The mansion became a political and literary salon for the likes of C.P. Huntington, Leland Stanford, Brete Harte and Mark Twain. The City sued Holladay saying the land had been reserved for a public park and the battle raged for almost 20 years, through four suits in local courts and up to the U.S. Supreme Court in 1896. Holladay won every time. Beyond litigation, the park made other news above and below ground. The first astronomical observatory on the West Coast was set up in 1879 by University of California Professor George Davidson, still considered a pioneer in his field. And in the 1906 earthquake, Lafayette Square became one of the tent campsites for refugees-- with awesome views of the fire and destruction of the city below. When Holladay died in 1915, his property inside Lafayette Park interested San Francisco financier and real estate mogul Louis Lurie. He made a deal with Holladay's son to exchange some land in Oakland for the plots, and, in 1927, Lurie launched a campaign to extend Clay Street into the park for access to the apartments he planned to build. Defeated by surrounding property owners and the City, in 1935, Lurie sold the land to the City for $200,000. Holladay's house was torn down the next year and in 1936, the City finally owned Lafayette Park. Almost. A handsome white six-story residence stands within the park, facing Gough Street. It is the St. Regis Apartments at 1925 Gough - the only privately owned building in a public park in San Francisco. Some say, in the country. Built between 1905 and 1908, it's a legacy Holladay left after the Supreme Court granted him the right to own property within the park. He sold this plot to Alexander Wilson, who built the St.Regis as luxury rentals that are now condominiums. 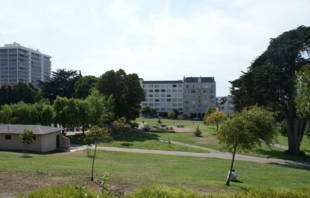 In 1981, the San Francisco Parks and Recreation Commission gave landscape architects Linda and David Gates a contract to restore the children's playground. Subsequently the park coasted scruffily along as constant daily use increased its wear and tear. 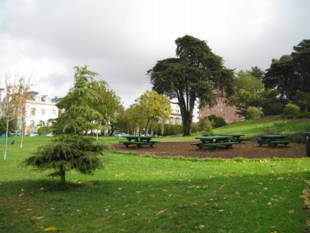 Along with maintenance, Richard Weinberger, Lafayette Park's venerable chief gardener for over 20 years, created a picnic area, clearing out the garbage, bushes and undergrowth that concealed a homeless encampment. 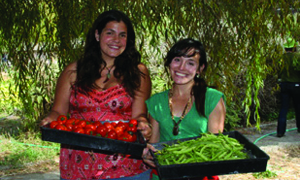 But the 11 -plus acres could use more hands. Enter Kim Barnes, the dynamic park advocate and realtor. She reconstituted the Friends of Lafayette Park and energized a core of residents and local businesses into making a change. Her Saturday volunteer corps of 30 has cleared wide areas of undergrowth and garbage and installed new plants. 'The consistent turn-out has amazed the local police, Rec and Park staff, and the volunteers themselves,' she says. After querying people living around the park about their concerns--from capital improvements to curb appeal--FOLP has instituted an individual donor program to help fund them. And Kim is on an all out promotion campaign for the Lafayette Park-NPC Gala on October 11. 'It's now more important than ever for residents to take care of their own back yards,' Kim declares.